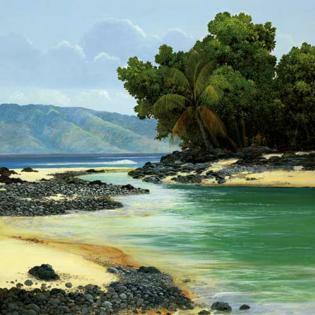 One of Hawaii’s brightest stars in fine arts, Upcountry artist Curtis Wilson Cost has lived on and painted the picturesque slopes of Halekala for over twenty years. 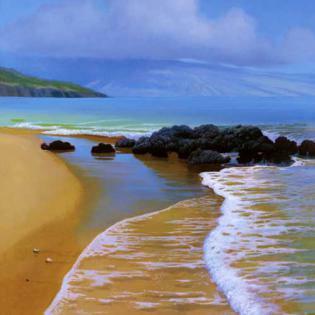 Through his realistic paintings of rural Maui, he has gained a worldwide reputation for his exquisite work. Although his landscapes seem to be of simple settings, his imagery and symbolism, his handling of light and color, and his use of composition evoke emotional memories of a simpler life; you can see through his work that Curtis is truly at peace with himself. “Colours” is one of Cost’s most popular prints, and depicts the stunning view of the west Maui Mountains that permeates all of Upcountry life. 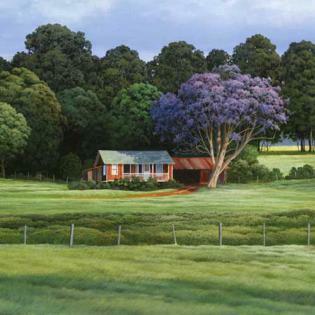 “Jacaranda Season” and “Upcountry Maui” are two paintings that capture the glorious colors of Maui, while reflecting the rural peace. His paintings have found the way into many major art galleries and home collections all throughout the Pacific Rim. 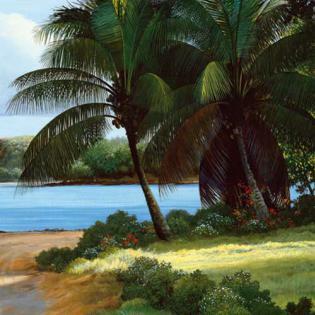 It has been said that you have not seen Hawaii until you’ve seen Cost’s paintings. The Curtis Wilson Cost Gallery is conveniently located in the Kula Lodge and Restaurant on the scenic road to Haleakala Crater. Take a scenic drive through beautiful Upcountry Maui with our map of the actual sites that inspired many of Cost’s oil paintings and come visit the gallery. Curtis Wilson Cost attends Art Night at The Kula Gallery on Friday nights from 6:00 to 8:00 pm, so stop in and meet the man himself.